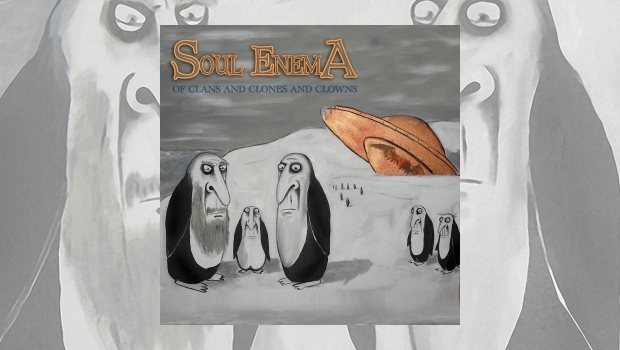 Soul Enema was formed in Israel in 2001, releasing their first demo EP in 2003. Seven years later they followed it up with the release of their debut album, Thin Ice Crawling, which was well received well by critics and review sites. Of Clans and Clones and Clowns is the follow up, released in June 2017. The band spent a lot of time trying to create the perfect follow up to their debut release and Of Clans and Clones and Clowns has a great assortment of powerful metal tracks with enough progressive influence and worldly sounds to attract your listening ears. There are vast strains of memorable music in this 14-track album, but there are also some tracks that can be skipped. As they write in the album’s promotional material, you can hear everything from “ABBA to Zappa, from King Crimson to King Diamond, between East and West and way beyond – in true progressive fashion”. My first impression came from Noa Gruman’s vocals – she is quite unique in the way she delivers her sound, powerful and unabated, but not piercingly high in pitch as with many female lead vocalists (which over time can become unlistenable). The piano moments from Aral Sea III will make you close your eyes and dream of oceans far and wide, despite being followed by some depressing lyrics from Noa. Omon Ra opens with a heavy guitar reminiscent of one of my favourite prog bands, Kingcrow, the backing vibe sounding similar to their song Evasion. The background sounds and noises are crazy cool. Aral Sea I – Feeding Hand is like a time warp going back to the symbolism and sounds of Dream Theater’s The Killing Hand. Spymania brings some cool vocal sounds at the opening, from Gruman, which makes it quite interesting, and the rest of the song reminds me again of Kingcrow from Timetropia. The organ work is exemplary. The Age of Cosmic Baboon has some wonderful Michael Rosenfeld sitar in the opening – but of course, with a title like this you knew it would be exotic. The flute from Yuri Ruslanov on In Bed with an Enemy is wonderful and Aral Sea III – Epilogue is an excellent instrumental where all of the musicians shine. Eternal Child, with a guest lead guitar appearance from Arjen Lucassen of Ayreon fame, is one of the best songs on the album with strong lead vocals from Noa and some great violin, percussion and orchestration help guide this one well. Although most of the album is a joy to listen to and completely different than what you hear most of the time from bands in the metal/progressive genre, it also has some heavy let downs. One of them is Cannibalissimo Ltd., which is absolutely horrible in concept, delivery and musical performance – this should have been an alternate track for only the extremely obsessed. The Last Days of Rome is another track that could have been left off the album for me. Teenage lyrics, sung with an adolescent vocal. Octopus Song makes Ringo’s Octopus Garden sound like a brilliant composition – which, in fact, it is anyway – Octopus Song on the other hand is completely the opposite. Overall though, I would say take a chance on this album from Soul Enema as there is more than enough good to outweigh the bad and it is different enough to keep you entertained and interested.